Rooplall Motilal Monar was born on Lusignan Sugar Estate, East Coast, Guyana, in 1945. His parents were both caneworkers. The family moved to Annandale in 1953 which Monar made his home. 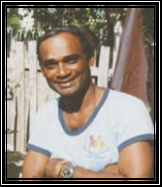 He attended Lusignan Government School, Buxton Congregational School, Hindu College and Annandale Evening College. He is a poet and writer. He has worked as a teacher, accounts clerk, freelance journalist, broadcaster and practitioner of herbal cures. He began writing in the mid-1960s and came to notice in 1967 with a prize-winning poem, The Creole Gang. His first published collection, Meanings (1972), began his exploration of the consciousness of the Indo-Guyanese “divided by horizon’s edges, yet/telling of no other worlds/but mine.” His second collection, Patterns (1983), continued the creative but painful potential of this limbo consciousness.